Corian® Quartz (formerly Zodiaq® quartz) is available in both 2cm and 3cm thicknesses. The width you choose is largely a personal choice. Regions in the western and southern part of the US tend to gravitate towards 2cm, while the Midwest, North and east coast primarily use 3cm. Trends around product thickness are also influenced by European trends. Both thinner (1/2”) and thicker (6”) islands are in style, in addition towards a trend towards thicker islands and thinner counters. 2cm quartz is primarily used in vanities. If you’re looking for a unique and dramatic visual effect, certain Corian® Quartz colors can be matched in a mirror image to give you the aesthetic you want. We call this “bookmatching,” and allows you to have a continuous design element in your islands, countertops, and vertical walls. The design will stand out in whichever room it is featured in. See below our common edge profiles, however, there are many edge profile designs other than those listed here. Check with your fabricator to determine which edge profiles are currently being offered. 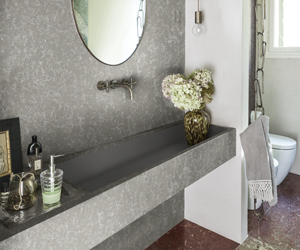 Now you can match the stunning aesthetics of Corian® Quartz with the proven performance and durability of a seamlessly integrated Corian® sink. The results are dynamic and modern and can be easily used in traditional and contemporary spaces. 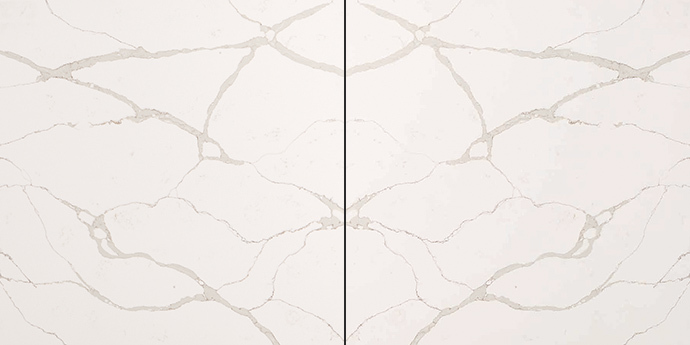 Create a sleek design, and avoid grout lines and residue buildup. All colors are provided in both 2cm and 3cm thickness. *Slab sizes of some colors may vary, depending upon the manufacturing source.